I tend to save biscotti for wintertime baking because making them, while easy, involves a bit more time working near a hot oven than I usually want to spend on a hot summer day. That being said, one recipe for biscotti makes a lot of cookies – cookies that keep very well, where one batch will last you quite a while – and they go just as well with iced coffee and iced tea as they do with their hot counterparts! 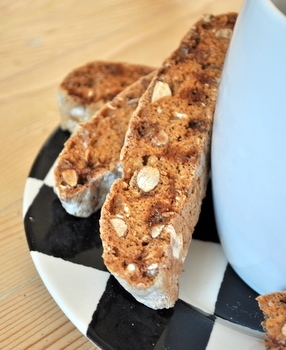 These are Almond and Toffee Biscotti, made with whole chopped almonds and bits of English toffee. Toffee and almonds are often paired together in other candies, making it no surprise that they should come together here. I used whole almonds and gave them a rough chop before adding them in. You can use toasted almonds, but these biscotti spend enough time in the oven that the almonds will toast up well all on their own. The toffee bits add a little extra sweetness to the finished cookies and make them a little more interesting than your standard almond biscotti. The cookies are first baked as a log of dough, which gives the structure a chance to set up. The logs are sliced into individual cookies, then the cookies are baked a second time until they are dry and crisp. The finished biscotti will be very crispy, but fortunately they have a light structure to them that makes them easy to bite into and not rock hard. Drizzle them with a little bit of melted dark or milk chocolate after they’ve cooled to give them a little bit of an indulgent edge. In a large bowl, beat eggs, adding sugar gradually, at medium speed until mixture is very light and creamy, 2-3 minutes. Beat in vanilla and almond extracts. At low speed or by hand, stir in flour mixture followed by the almonds and toffee bits. Drop big spoonfuls of batter onto a prepared baking sheet to form two long lines of dough and, with very well floured hands, shape the irregular lines of dough into two rectangular logs about 1/2 inch high. Make your logs longer and thinner of you prefer short cookies, wider if you prefer long cookies. Use more than one baking sheet, if necessary. Bake at 350F for 20 minutes, until logs are a light golden color and are fully set (they will spring back slightly when touched with a finger, like a cake). Using a sharp, serrated knife, slice logs into 1/3 inch thick slices (1-1.5 cm) and lay flat (on their sides) on baking sheet. Lower oven temperature to 300F. Bake sliced cookies for 15 minutes, flip them and bake for an additional 15 minutes. If cookies were sliced thickly and do not seem crisp, turn once again and bake for 10 more minutes. Ohh.. my favorite snack! Biscotti! Thanks for sharing this recipe! What exactly did you use for the toffee? 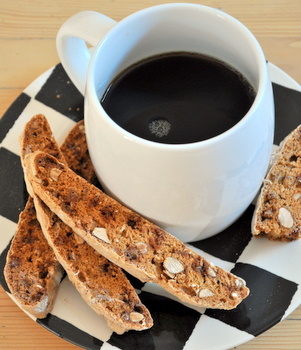 These biscotti look lovely… I love new biscotti recipes to try, so I’m adding this to my list! 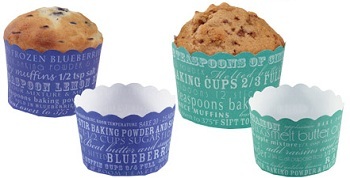 Are these light and crisp (American-style)? Or are they hearty and need to be dunked (Italian-style)? These were really good! Thanks Nicole! I made this recipe this morning. It was very easy and delicious! I did choose to drizzle melted white chocolate and milk chocolate chips over the tops! I will definitely use this recipe again!